Earlier this year, I attended five films in a series at Japan Society in New York entitled “The Most Beautiful: The War Films of Shirley Yamaguchi and Setsuko Hara,” curated by Aiko Masubuchi, and wound up seeing five films there, three of them starring Yamaguchi, more widely known as Yoshiko Yamaguchi, and two of them starring Hara, all made in the years 1937-1943, during the period of Japan’s occupation of China. 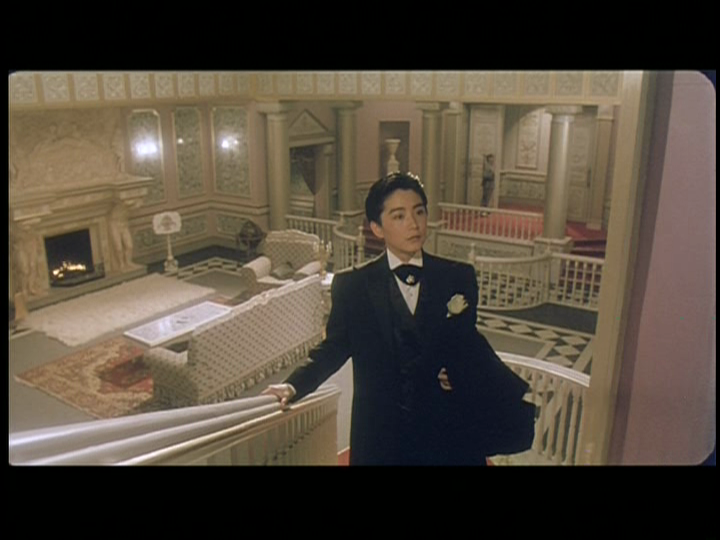 As preparation for seeing these films, I began reading a novel about Yamaguchi called The China Lover, by historian Ian Buruma, who has written several books about Japanese history and culture, two of which I’ve read. In the novel, there’s a character named Yoshiko Kawashima, who is also known as Eastern Jewel, a historical figure who was a princess of the Manchu royal family and a cousin of Pu Yi, the famed “Last Emperor” of China. She got her Japanese name when she was sent to Japan at the age of six to be raised by Naniwa Kawashima, a Japanese translator of Chinese and friend of Yoshiko’s father, Prince Su. She self-identified as Japanese for much of her life. 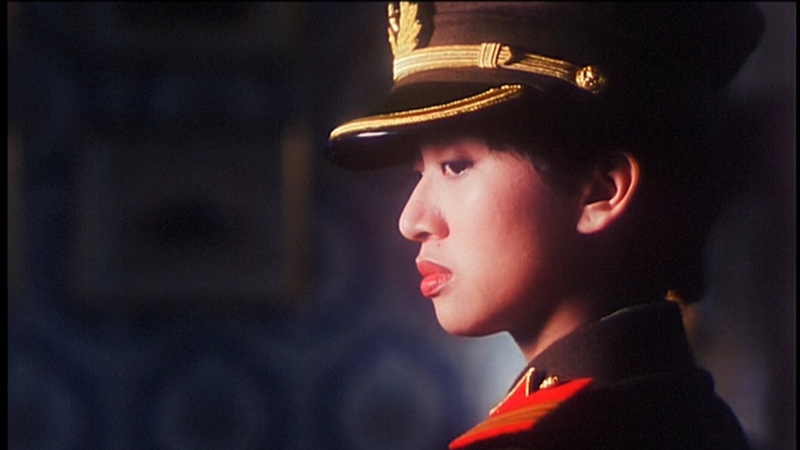 I realized as I was reading about her that I own a DVD of a Hong Kong film called KAWASHIMA YOSHIKO (1990), a full-scale biopic starring Anita Mui in the title role. I’d never seen it, so I resolved to do so at the earliest opportunity. 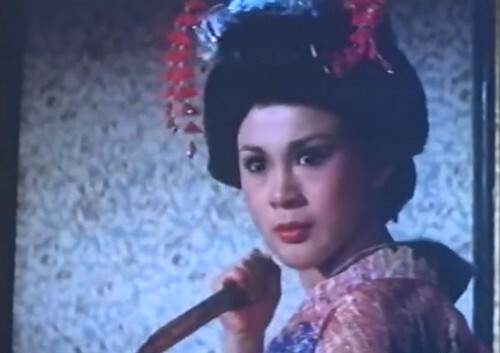 At some point during this period, quite by chance I came across a film on YouTube called LADY KARATE (1976), starring one of my favorite kung fu divas of the 1970s, Chia Ling. 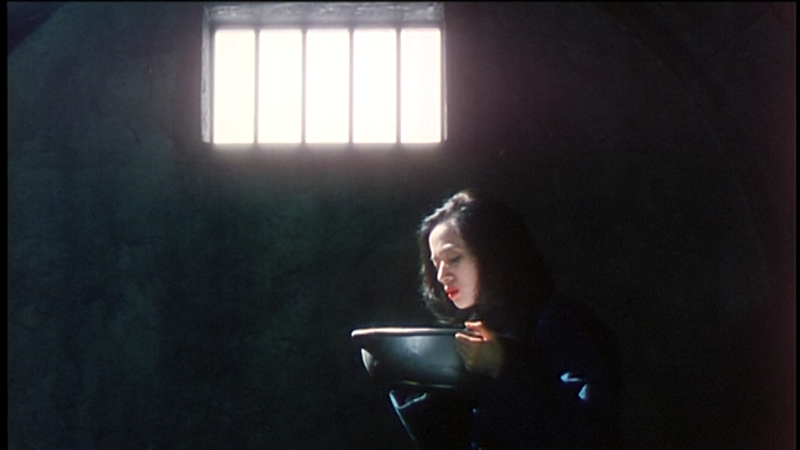 Within the very first scene, I was awestruck to realize that this was another film about Yoshiko Kawashima, but with kung fu added, so I watched that. 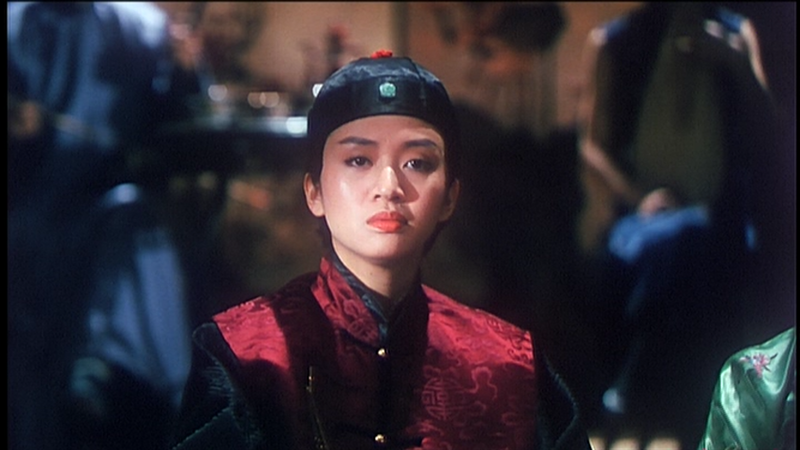 A little research turned up the info that Kawashima was also a character in Bernardo Bertolucci’s Best Picture winner of 1987, THE LAST EMPEROR, in which she’s identified as Eastern Jewel, so I resolved to seek that film out and watch it as well, for the first time since 1988. 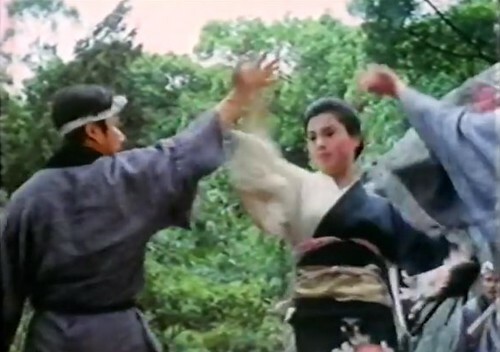 Further research turned up another film featuring Kawashima as a character, the Hong Kong film, THE RAID, co-directed by Tsui Hark (ONCE UPON A TIME IN CHINA) and Ching Siu-Tung (SWORDSMAN II). I had a DVD of THE RAID buried in a closet somewhere and had once reviewed it for IMDB in which I referred to the character only as a Japanese military officer’s “girlfriend who has built up a false public image as a Chinese glamour girl.” Little did I know when I did that review back in May 2001. 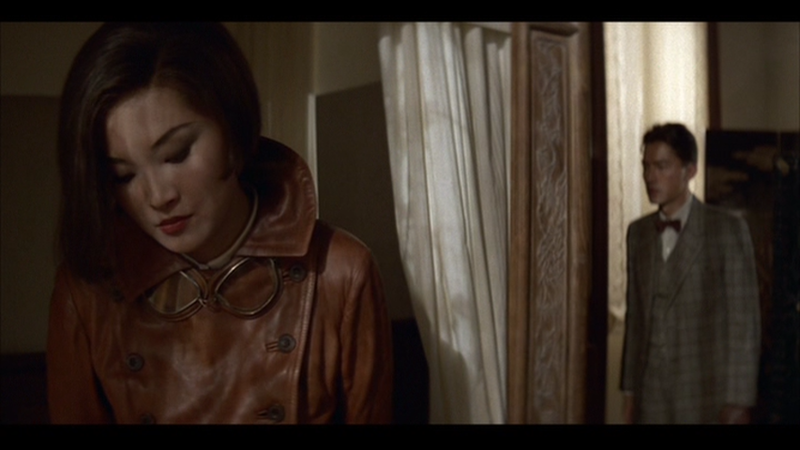 I resolved to dig that film out and watch it again. At some point during all this activity, after I’d seen the films at Japan Society and finished reading The China Lover, but before I’d watched KAWASHIMA YOSHIKO and the other films about her, the gods of synchronicity continued to smile upon me as a review appeared in the Sunday Book Review section in the May 3, 2015 edition of The New York Times for a full-scale biography of Kawashima entitled, Manchu Princess, Japanese Spy: The Story of Kawashima Yoshiko, the Cross-Dressing Spy Who Commanded Her Own Army, by Phyllis Birnbaum and published by Columbia University Press. I wasted little time in going out to look for it in bookstores. (Barnes & Noble didn’t carry it, but I found it in Kinokuniya Books.) 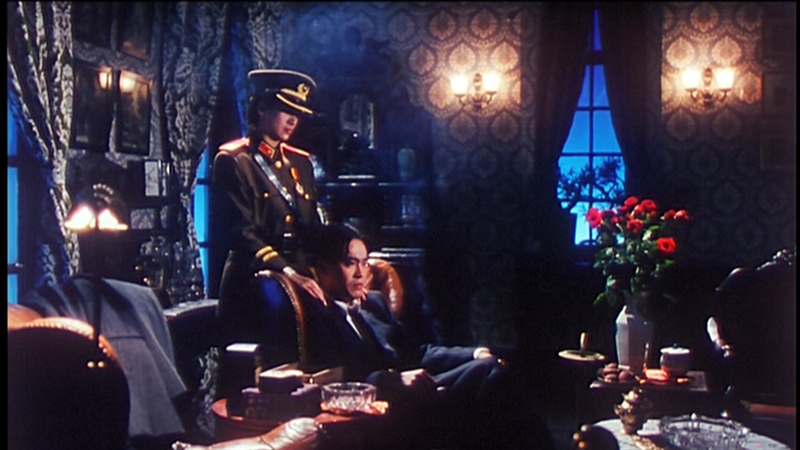 So I set out to read it and see each of the films, with KAWASHIMA YOSHIKO getting more than one viewing. As I look back, I wonder about my life. I get a strong feeling that it’s all amounted to nothing. When much is made of you in the world, you are truly a flower. But during that time there are also people who come to you in reckless throngs, hoping to make use of you. You shouldn’t let yourself get dragged along by such people. You should stick to your beliefs. This is the best time for you to speak up about exactly what you want for yourself. You do what you truly want. Here before you is a good example of a person who was used by others and then thrown away like garbage. Have a good look at me. I offer this warning to you based on my own experience. 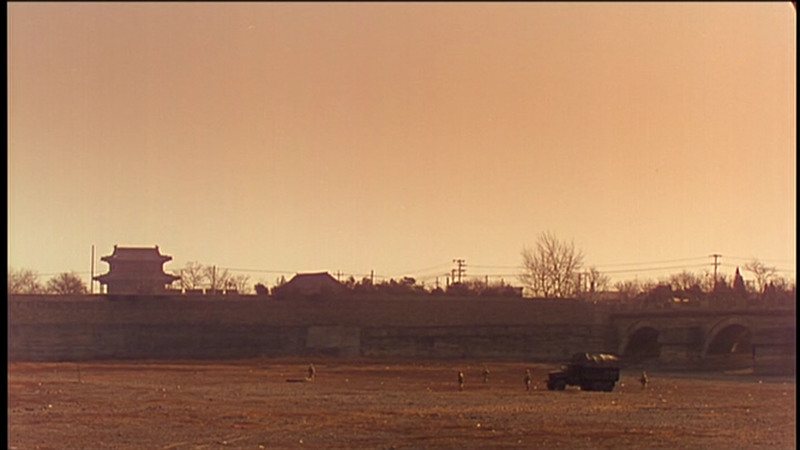 Now I feel myself in a wide field staring out at the setting sun. I am lonely. I wonder where I should walk all by myself…. You and I were born in different countries, but we have much in common, even our names. I’ve always worried about you. Still, Kawashima behaved in a way towards her friends and lovers that would be described today as “high maintenance” and she sought to maintain a certain amount of high living at other’s expenses. 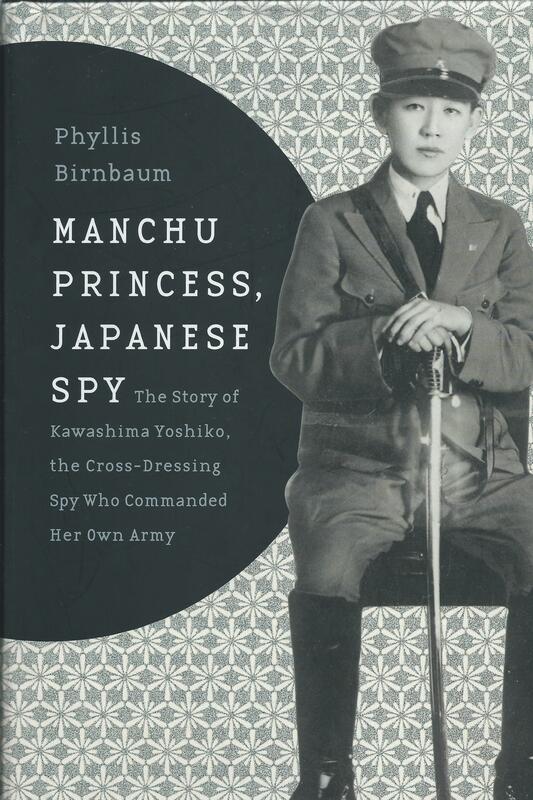 As Birnbaum’s book makes clear, it’s not easy to ferret out fact from fiction in the literature and press reports that were devoted to Kawashima in her lifetime in both Japan and China (starting in Japan when she was still a girl). 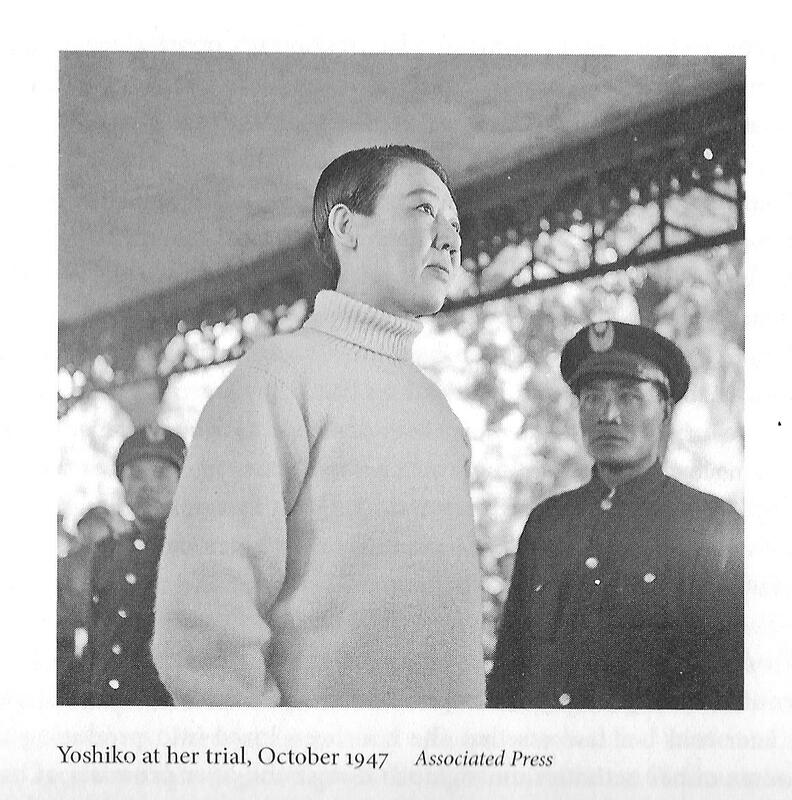 A legend had been built around her while she was still in her 20s (she was born in 1907) and it’s hard to know which feats of derring-do (or treason, depending on your point-of-view) on behalf of Japan she’d actually participated in. 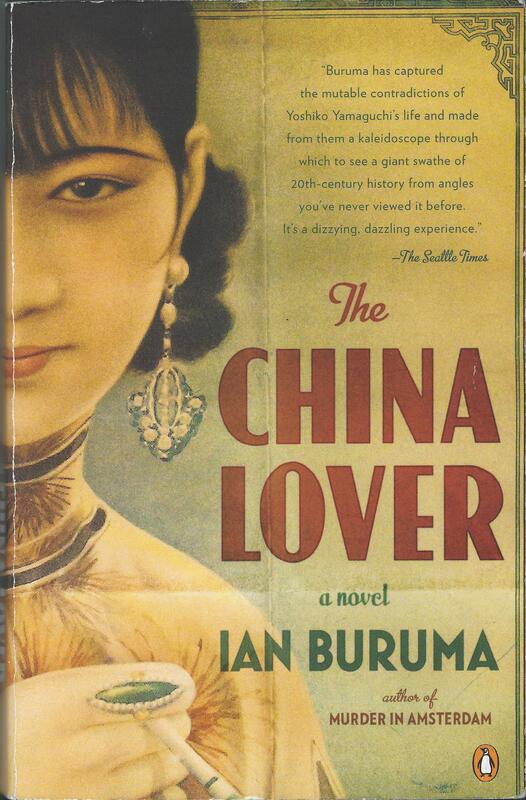 She was often described as “Mata Hari of the East” and lauded in press reports as “the Japanese Joan of Arc.” Still, it’s doubtful that she ever said, “I want to bomb Shanghai, I hate China,” as her character says in THE LAST EMPEROR, but Birnbaum indicates that she played some role in hiring Chinese workers to instigate anti-Japanese violence that triggered the Shanghai Incident of 1932, a bloody battle that left thousands dead, all engineered by Major Ryukichi Tanaka, one of Kawashima’s Japanese benefactors, to serve the purposes of the Kwantung Army in Manchuria. Japanese from the Foreign Ministry, the military, the privileged, and the capitalists talk about Sino-Japanese friendship every time they open their mouths. 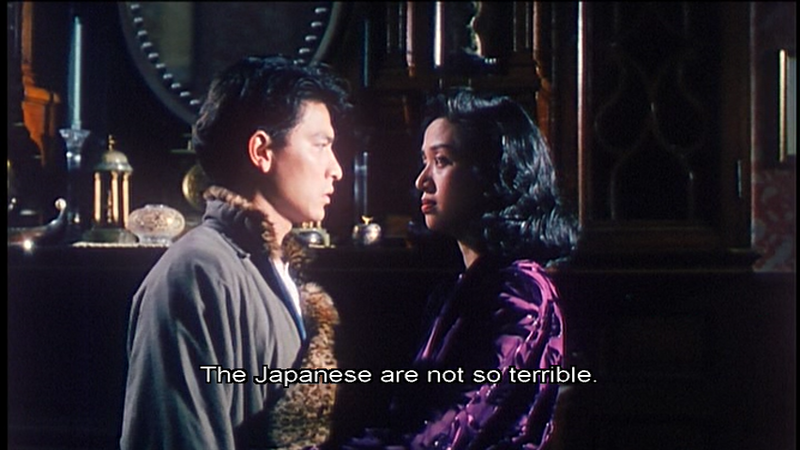 But the Sino-Japanese friendship they’re talking about is only a Sino-Japanese friendship that profits the Japanese. 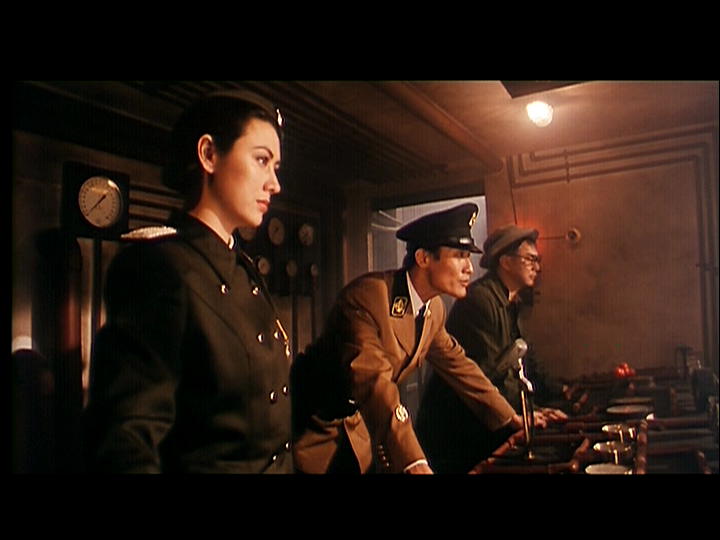 At some point, the Japanese officers who had made use of her all agreed she would have to be neutralized in some way. Orders to kill her were issued over the years but no one wanted to carry them out, so she would usually get spirited away somewhere to keep her out of harm’s way, with orders for her to stay out of trouble, although she often managed to find it anyway. 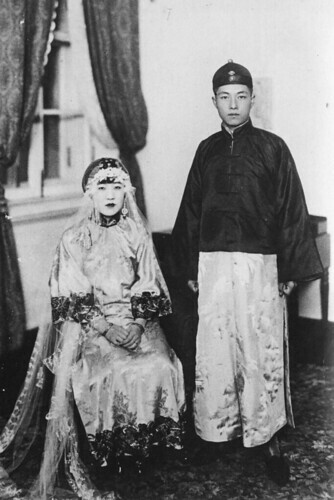 She found herself back in China when the war ended and she refused to heed warnings to flee back to Japan. 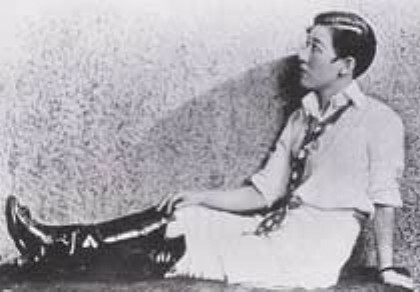 In the end, Kawashima is probably best known for her flamboyant personal style and her frequent gender-bending, cutting her hair short and wearing male clothes in public, ranging from tuxedos to military uniforms to the garb of a male Chinese scholar. 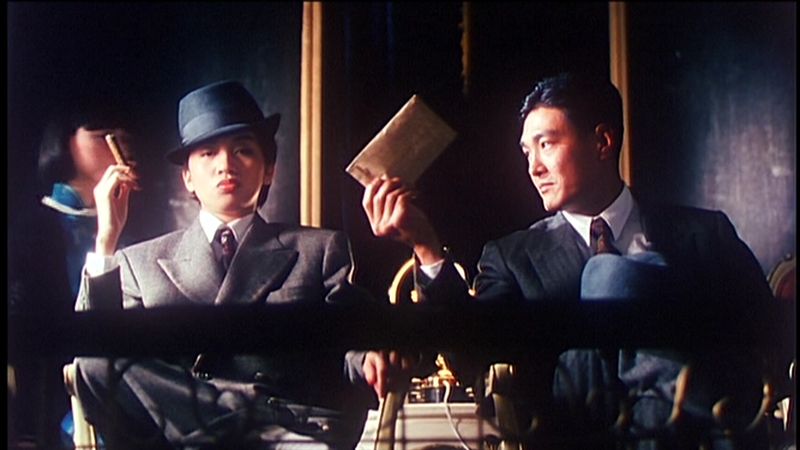 There was even a novel about her, published in 1933, entitled The Beauty in Men’s Clothing, by a Japanese writer living in China, Shofu Muramatsu. She would sometimes wear men’s suits and dance with women at Shanghai nightclubs. 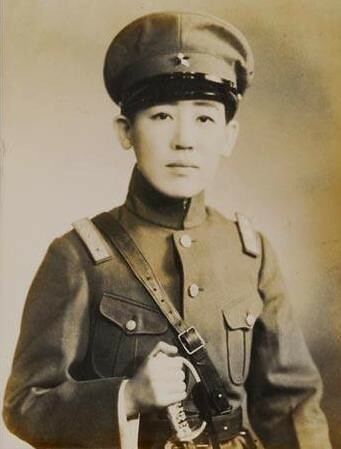 This behavioral pattern began early in her youth while still in Japan and started when she shaved her head after her adoptive father broke up her relationship with her young lover, a Japanese military officer-in-training, Toru Yamaga. She was only 18, yet this haircut got extensive press attention in Japan. 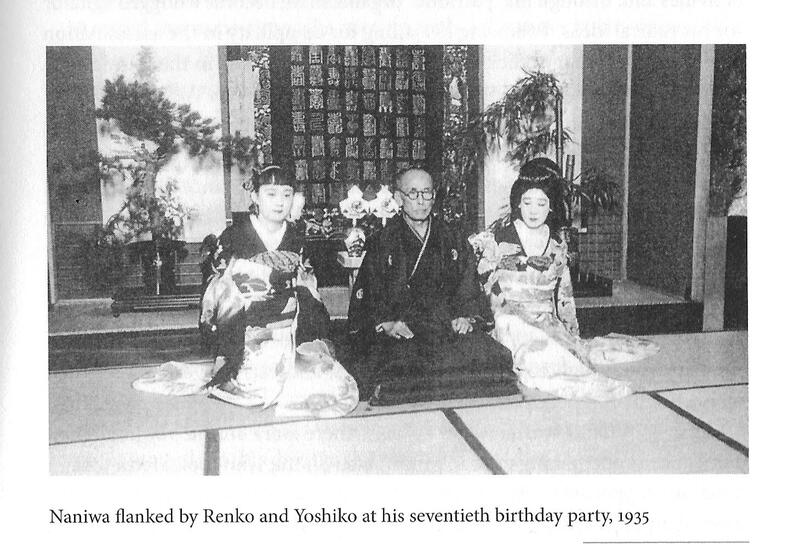 There was some belief that her death was staged with the shooting of a blank and that she was secretly ushered off to Japan to live out the rest of her days quietly and far from the public eye, although Birnbaum is skeptical of such stories. 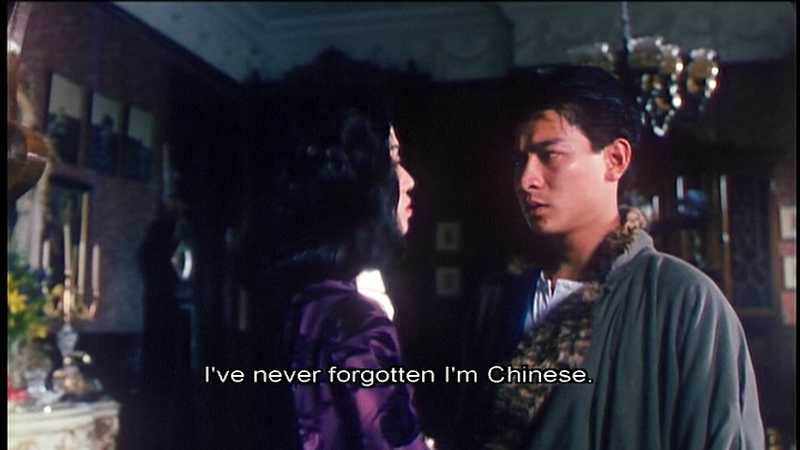 I’m not sure how many films were made that featured Kawashima as a character. 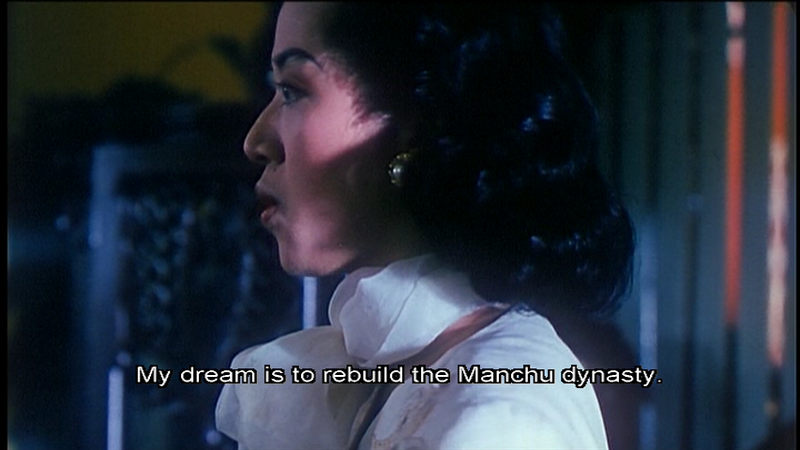 Birnbaum mentions one, THE DAWN OF THE FOUNDING OF MANCHURIA AND MONGOLIA (1932), directed by none other than Kenji Mizoguchi himself! She also cites THE LAST EMPEROR but doesn’t mention any others. She doesn’t even mention Ian Buruma’s book or any of the other novels that have been written about Kawashima in the years since her death. 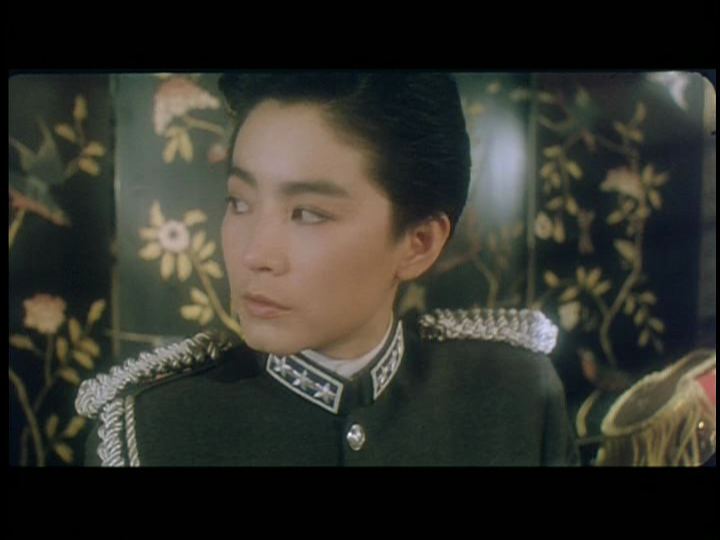 The earliest film I’ve seen about Kawashima is LADY KARATE, aka SPY RING AT KOKURYUKAI (1976), made in Taiwan and starring Chia Ling as “Yoshiko.” In the film, the focus of the plot is the Japanese military’s mission to spirit Pu Yi, the last emperor, out of Tientsin and up to Manchuria by boat, where he can resume the throne and give legitimacy to Japan’s puppet state of Manchukuo. 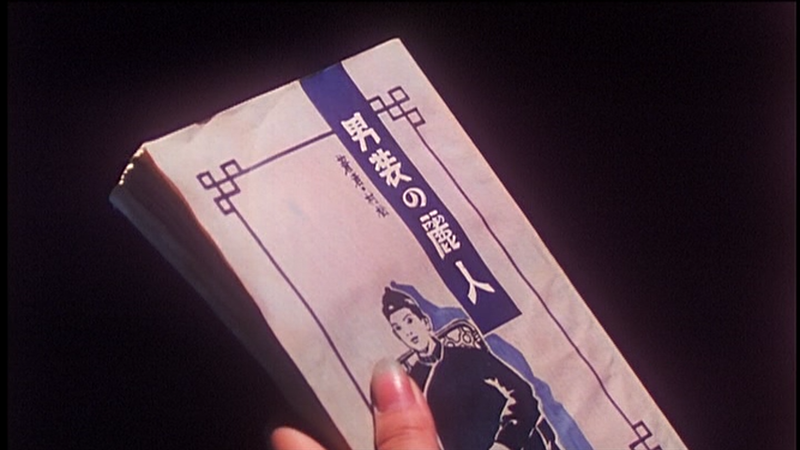 Yoshiko’s assignment is to convince the emperor to go with the Japanese. 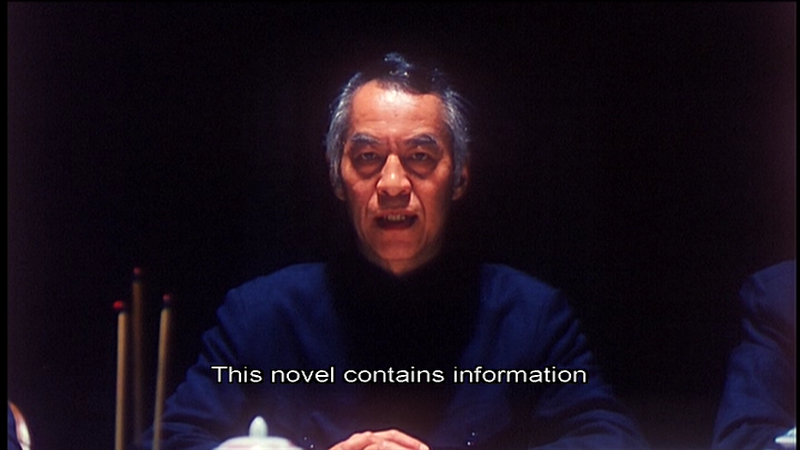 (In real life, according to Birnbaum, Kawashima was not involved in this action.) 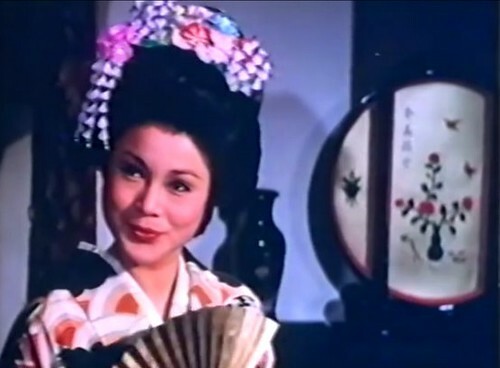 The film’s fanciful depiction of Yoshiko includes dressing her like a Japanese geisha for most of her scenes and having her run a brothel in Tientsin. 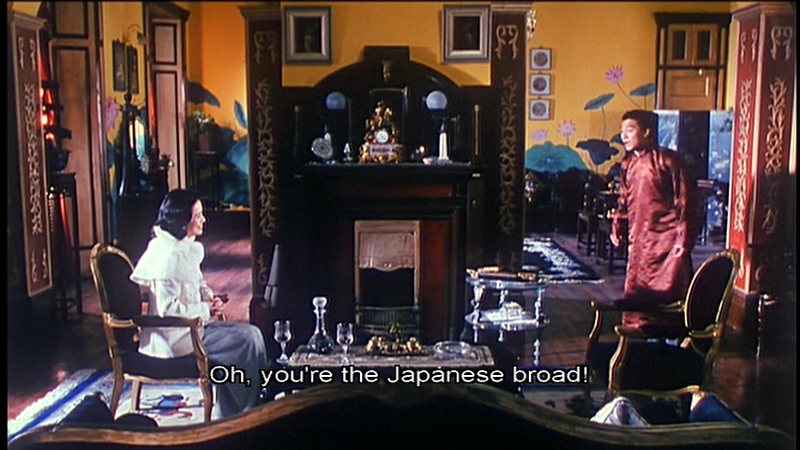 (She did run a restaurant, but not a brothel, and I don’t believe she ever dressed like a geisha while in China.) 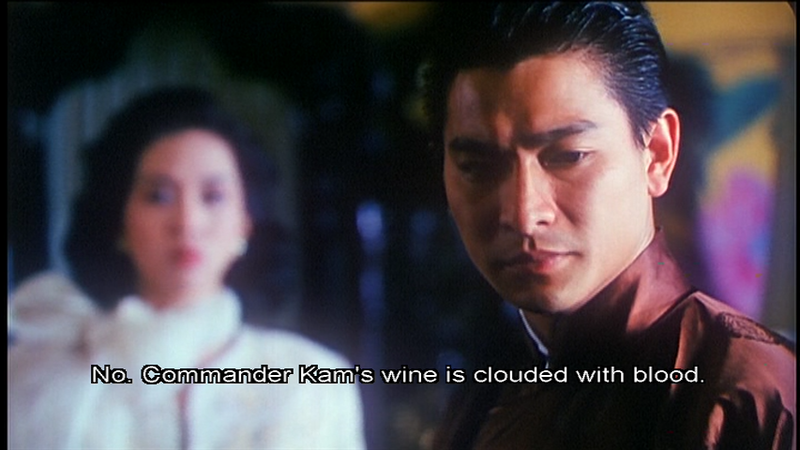 There are lots of action scenes with ample doses of kung fu, swordfighting and gun battles, none of which occurred during the actual leadup to Pu Yi’s departure for Manchuria. 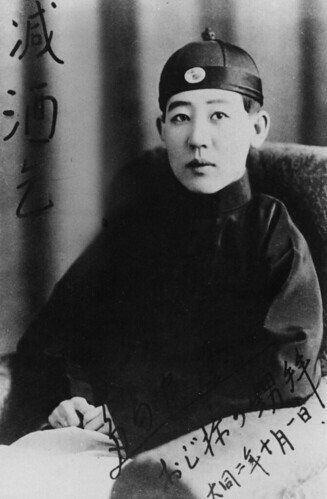 Kawashima is often credited with getting Pu Yi’s unwilling wife, Wanrong (or Wan Jung), out of Tientsin later on, to join her husband in Manchuria, but Birnbaum was unable to find any actual evidence supporting that. 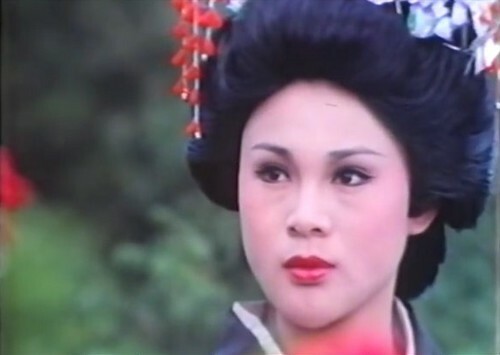 Chia Ling, a Taiwanese actress with a background in Peking Opera, appeared in about four dozen kung fu films from 1972 to 1984. 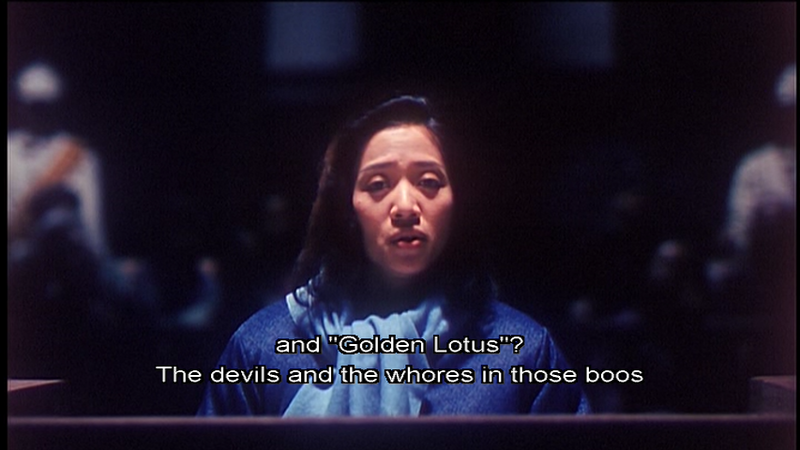 The director of LADY KARATE is Shan-Hsi Ting, who directed other kung fu films in my collection, but nothing of any particular note. Here is my IMDB review of LADY KARATE. It’s dubbed in English and pan-and-scanned, but I don’t know of its availability in any other format. 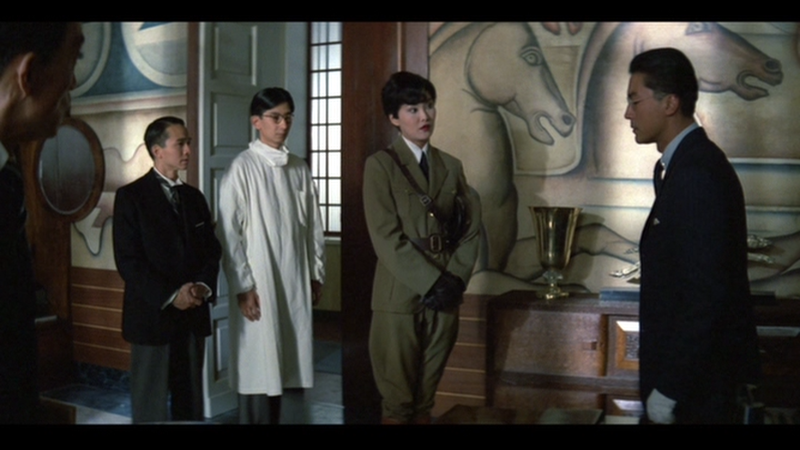 THE LAST EMPEROR (1987) was, of course, the first film I saw with Kawashima as a character, but until I rewatched it on Criterion DVD for this writeup, I hadn’t seen it since it played theatrically in New York after its Oscar win for Best Picture at the ceremony in 1988. 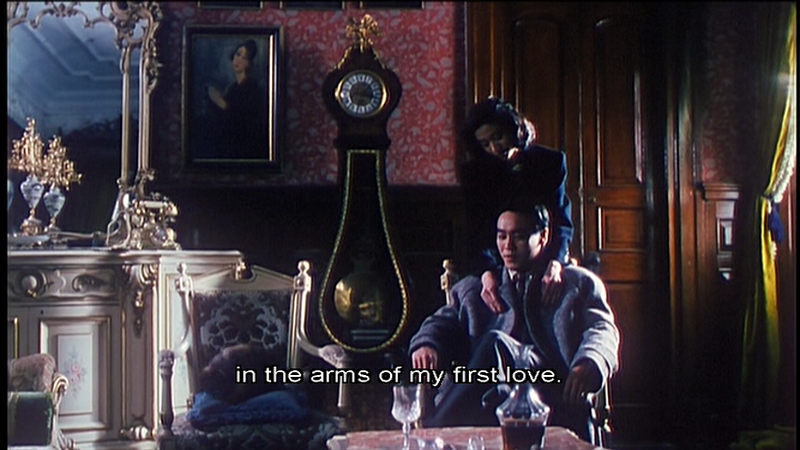 I had not remembered Kawashima’s character in the film, nor had I heard of her at the time. 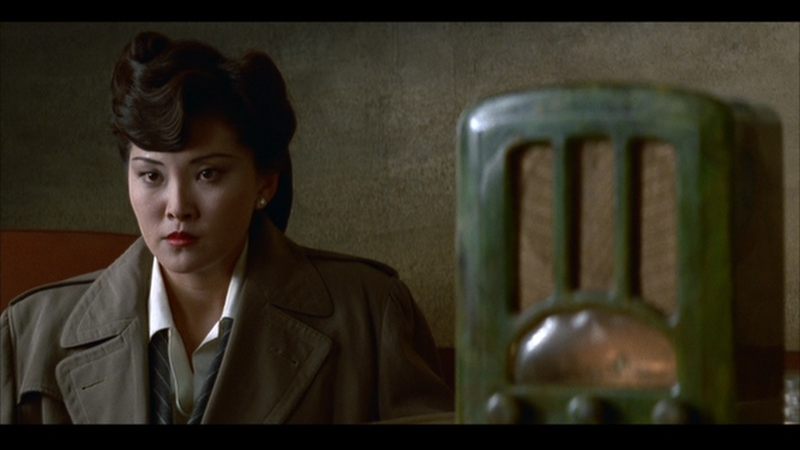 In the film, she’s identified as Eastern Jewel and is played by an American named Maggie Han. 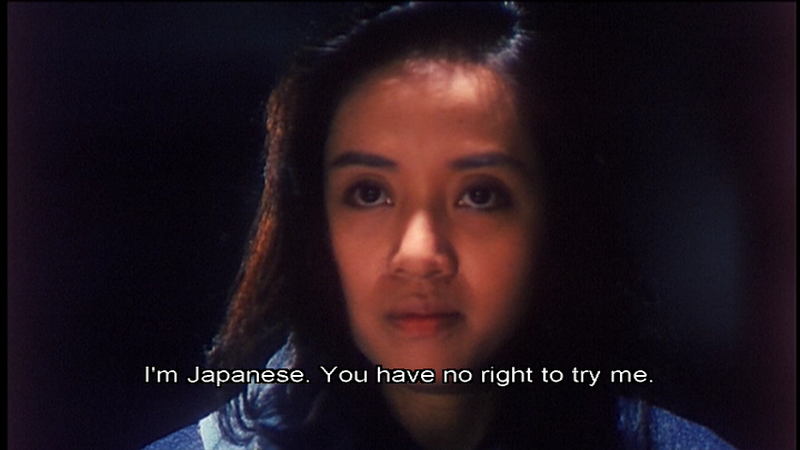 The entire film was shot in English and the actress delivers all her lines with an unlikely English accent, although, to be fair, any accent would have been unlikely since Kawashima spoke mostly Japanese and was barely fluent in Mandarin. 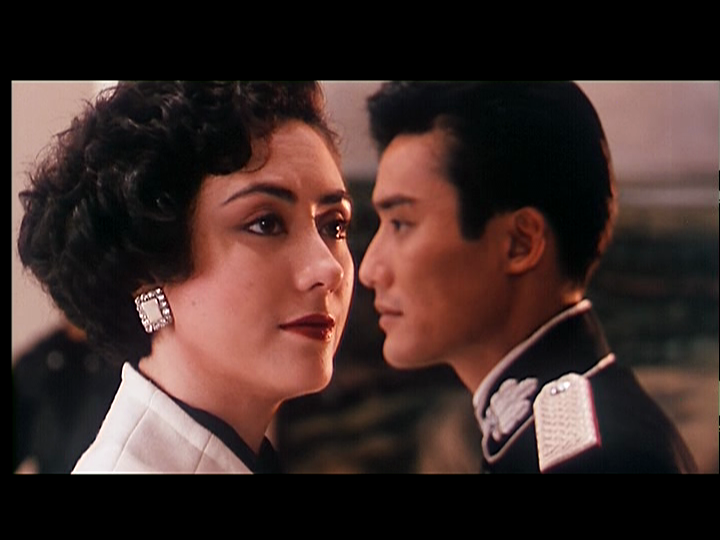 She appears in five scenes, with substantial dialogue only in her first scene, where, dressed in pilot leathers, she greets Pu Yi (John Lone) and his wife (Joan Chen) in Shanghai, setting up a relationship with the empress wherein she supplies her with opium and delivering the bad news to Pu Yi that soldiers working for Chiang Kai-Shek have plundered the imperial tombs of the royal family. 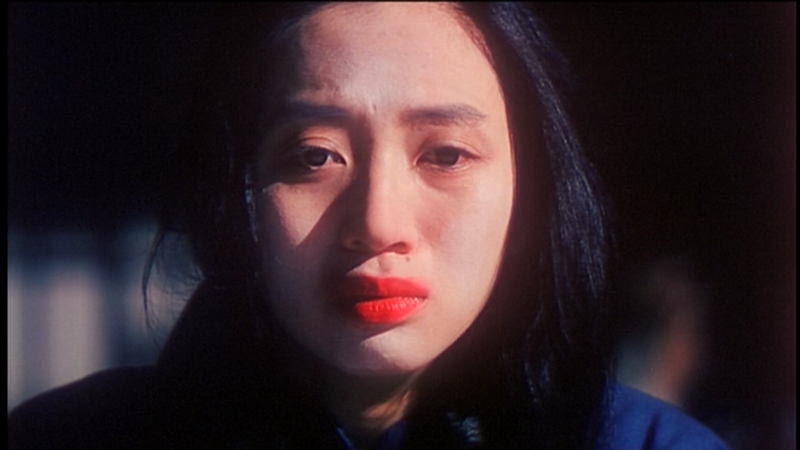 She appears in four other scenes, in different garb in each. He’s not even listed in the index. Nowhere does Birnbaum indicate that Kawashima ever even met Amakasu. 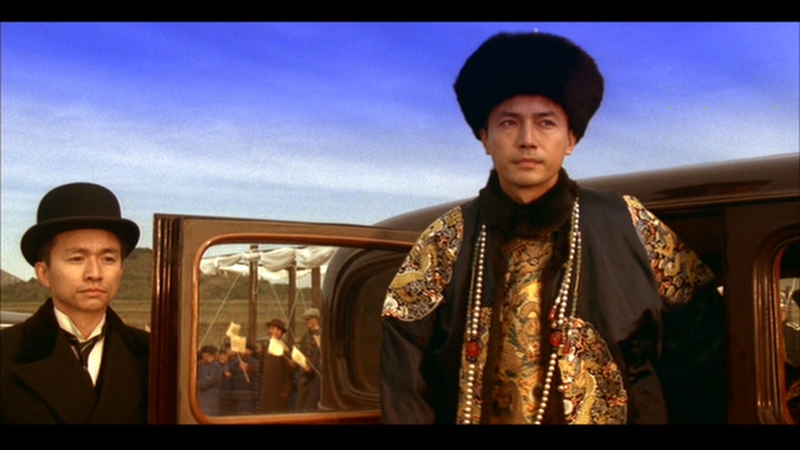 In any event, the portrayal of Eastern Jewel in THE LAST EMPEROR doesn’t match anything in Birnbaum’s book. 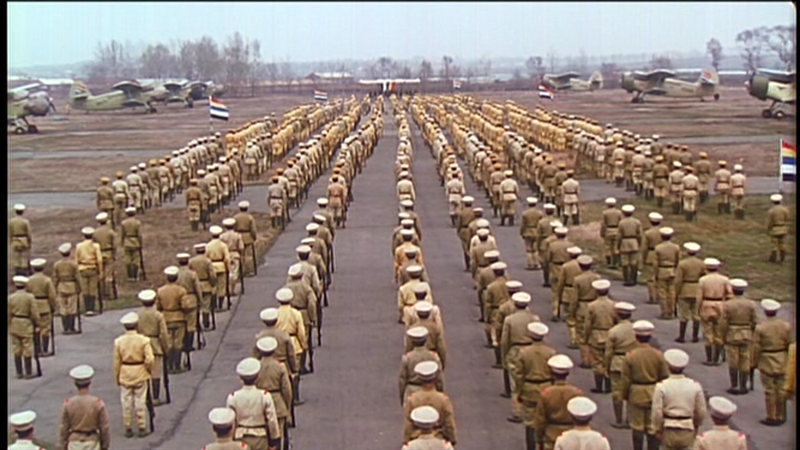 Next we come to THE RAID (1991), an Indiana Jones-meets-Hong Kong wire-fu film in which Chinese resistance fighters take on the occupation army in Manchuria and undertake a mission to destroy a factory that makes poison gas and uses Chinese captives as guinea pigs on which to test the effects. For a serious plotline like that, the film is awfully light-hearted and more of an action comedy than anything else. 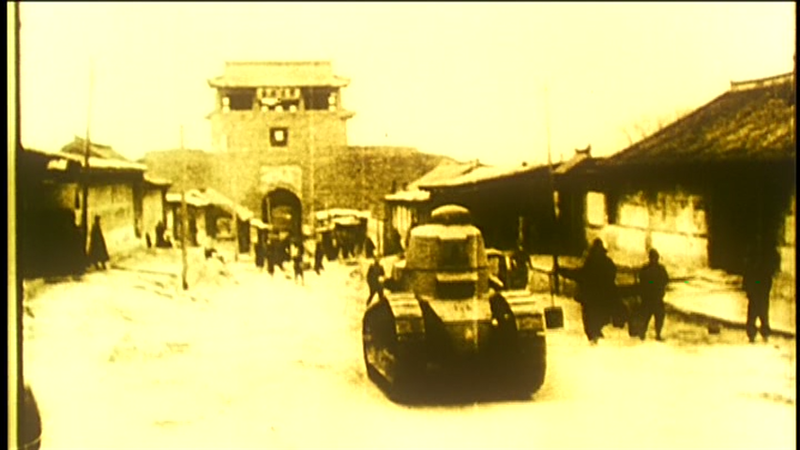 What’s most alarming about it is the refusal to identify the occupying army as Japanese. 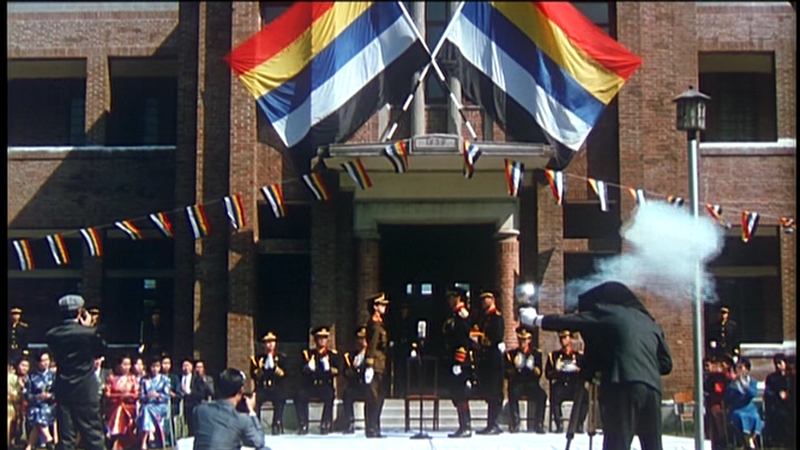 In fact, the filmmakers have created a fake flag and fake insignia for this army, which is headed by someone named Masa (played by Hong Kong actor Tony Leung Ka Fai of DRAGON INN and THE LOVER fame), who is the power behind the throne occupied by “Last Emperor” Pu Yi, who’s a significant supporting character here. 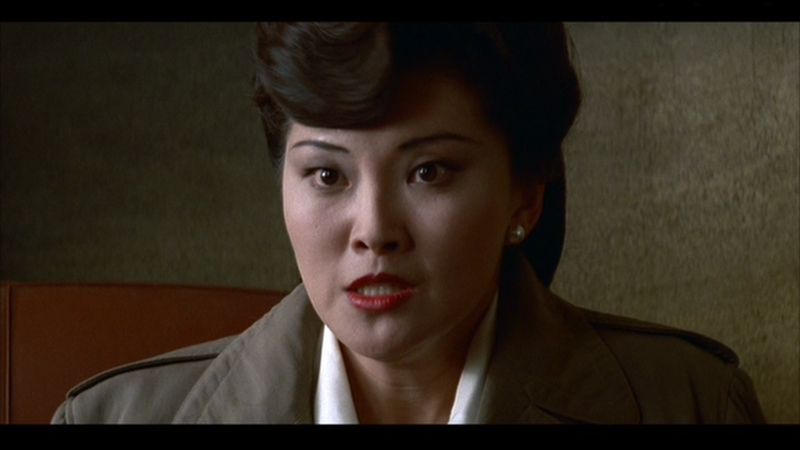 Joyce Godenzi plays Kim Pak-Fai, a Chinese singer who, at some point in the narrative, is revealed to really be Yoshiko Kawashima, the only hint the film gives that the enemy is Japanese. 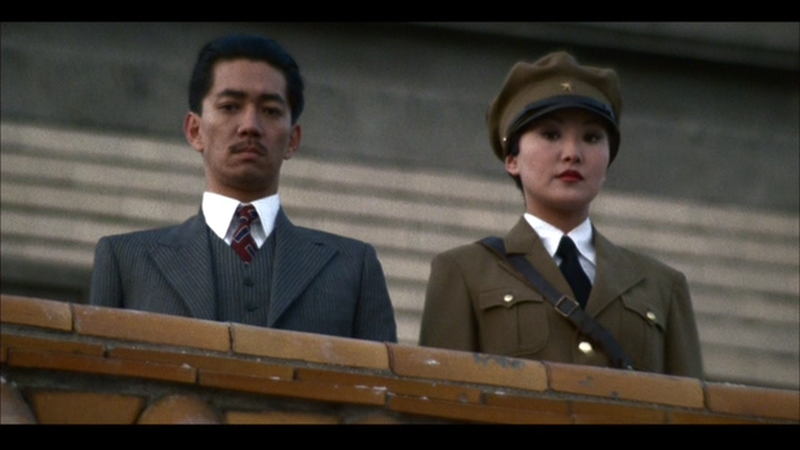 She is Masa’s lover and helps him run the poison gas factory. 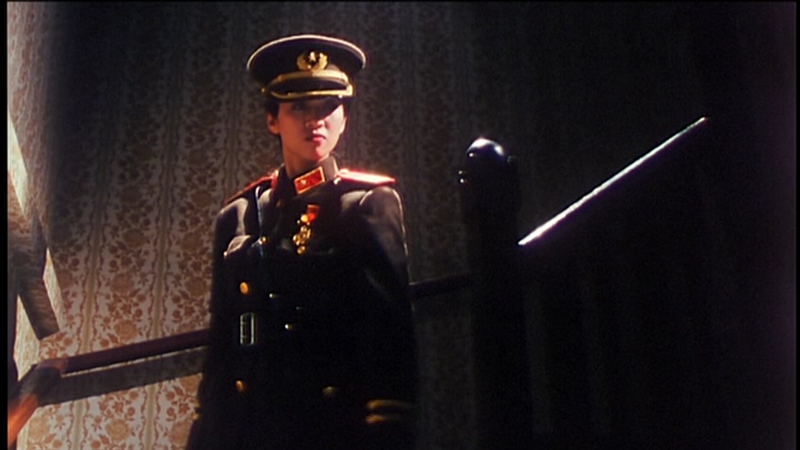 She’s played in full femme fatale mode, alternating gowns with military garb, and is quite brutal toward the Chinese. She is killed in a gory death during the big action finale at the gas factory. Needless to say, none of this has any basis in fact. 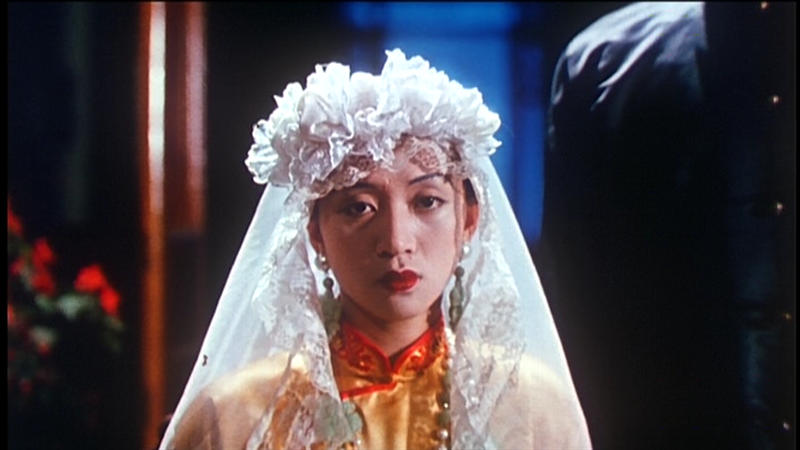 Joyce Godenzi had an Australian father and a Chinese mother and appeared in a number of Hong Kong action films, often in a fighting role, from 1986 to 1991, including EASTERN CONDORS (1987) and SHE SHOOTS STRAIGHT (1990), before marrying Hong Kong kung fu star-director Sammo Hung. 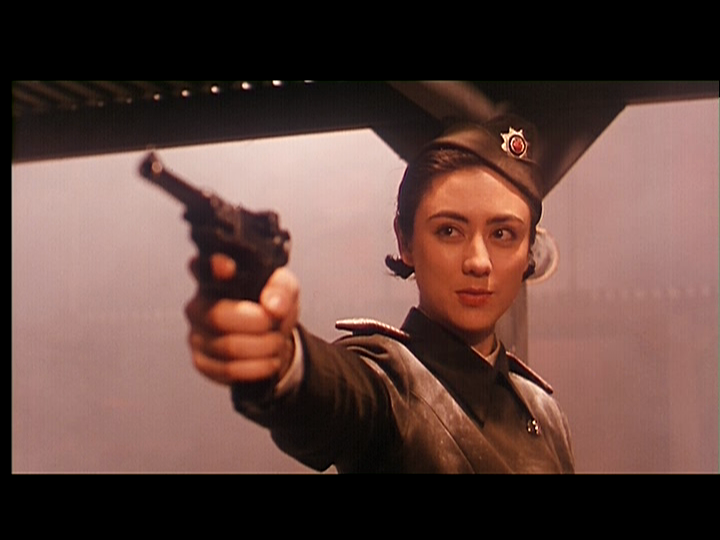 (The director of SHE SHOOTS STRAIGHT, Corey Yuen, is her co-star in THE RAID.) 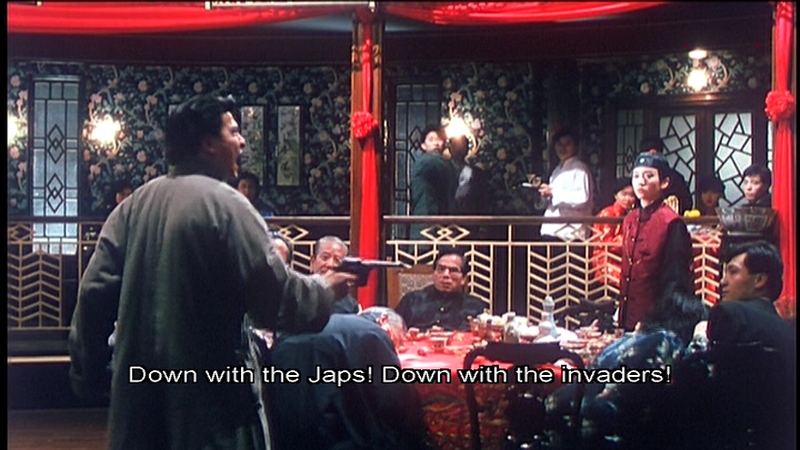 As stated above, THE RAID was co-directed by two masters of Hong Kong action, Tsui Hark and Ching Siu-Tung. Here is my IMDB review of THE RAID. 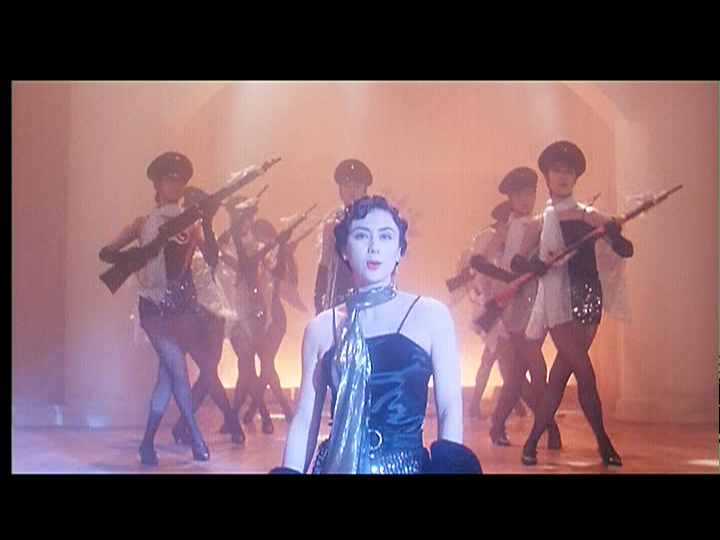 Interestingly, THE RAID came out one year after Kawashima was given the full-blown biopic treatment in a Hong Kong film, KAWASHIMA YOSHIKO (aka THE LAST PRINCESS OF MANCHURIA, 1990), in which she’s played by Hong Kong superstar singer-actress Anita Mui. 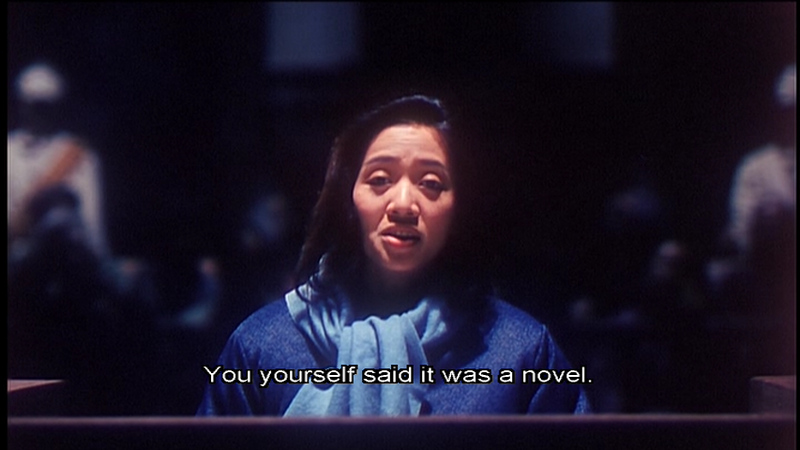 The film was based on a novel, The Last Princess of Manchuria, by Lillian Lee, a well-known Hong Kong novelist whose books were made into such movies as ROUGE, FAREWELL MY CONCUBINE, TEMPTATION OF A MONK, and GREEN SNAKE, and who wrote the screenplay herself for this film. (I have since learned that the book has been translated into English and I’ve ordered a copy via Amazon.) 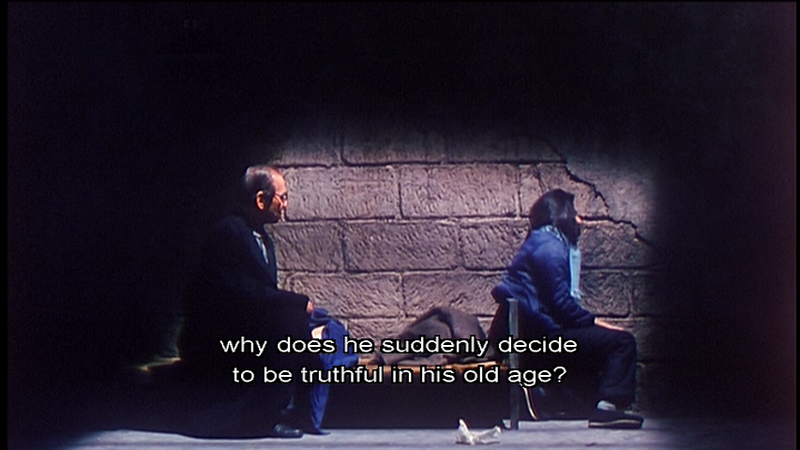 A lot happens in the film that doesn’t seem to have any basis in fact. For one thing, Mui’s Kawashima is pretty cold-blooded. 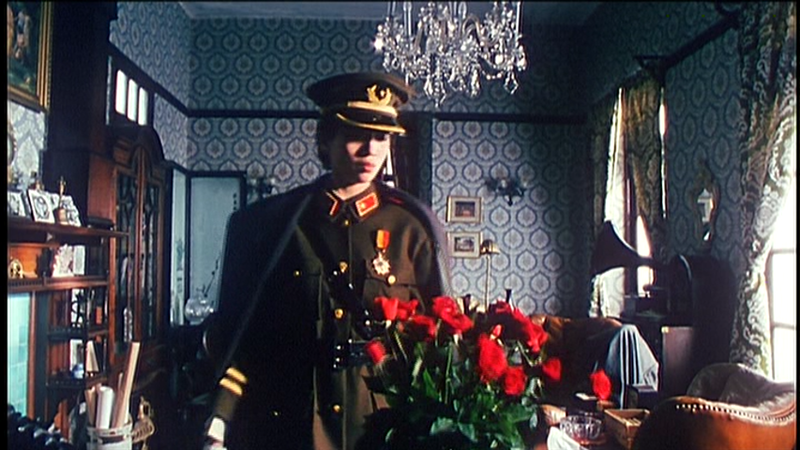 When someone from her army shoots and wounds her at a military dress parade, she is shown afterwards torturing and interrogating the would-be assassin. 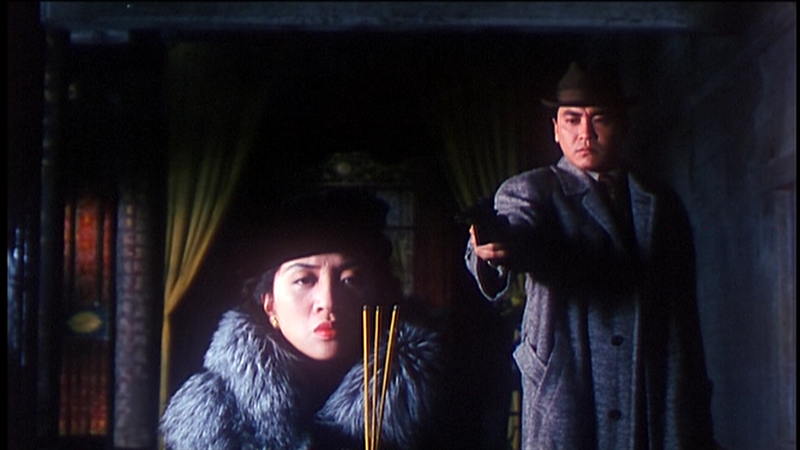 When she’s assigned to spirit Empress Wan Jung out of Tientsin, she shoots the Chinese agent who assists her, a man named Lam (Lawrence Ng), for reasons that aren’t made clear, and says over his body, “A pity. 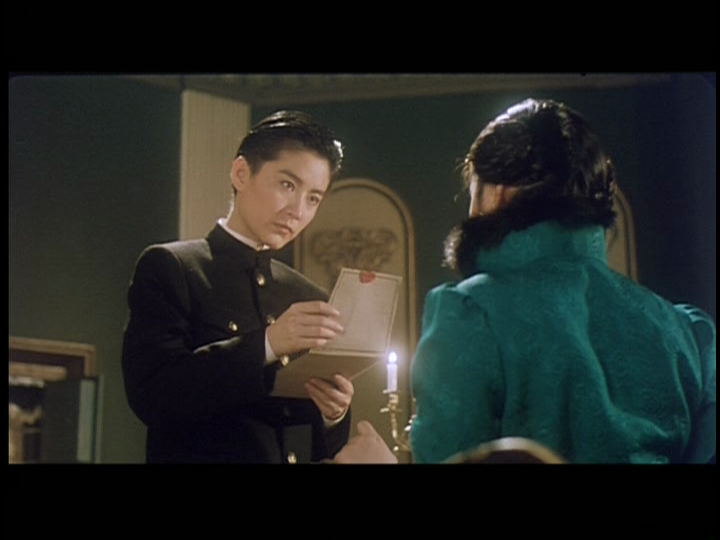 Such a handsome guy.” She then transports the empress out of Tientsin in an ambulance, having led her into thinking she’s going to Shanghai. I don’t think any of these things happened (not that I can prove it). 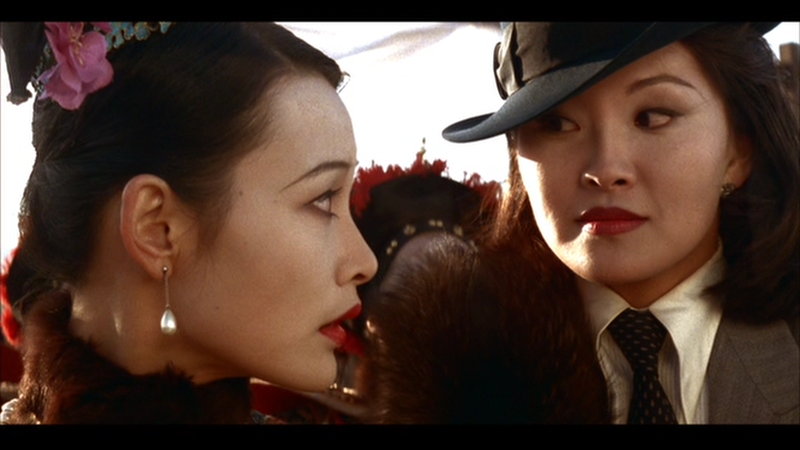 The film does credit her with instigating the Shanghai Incident of 1932 and supplying information to the Japanese, something Birnbaum had indicated as well. 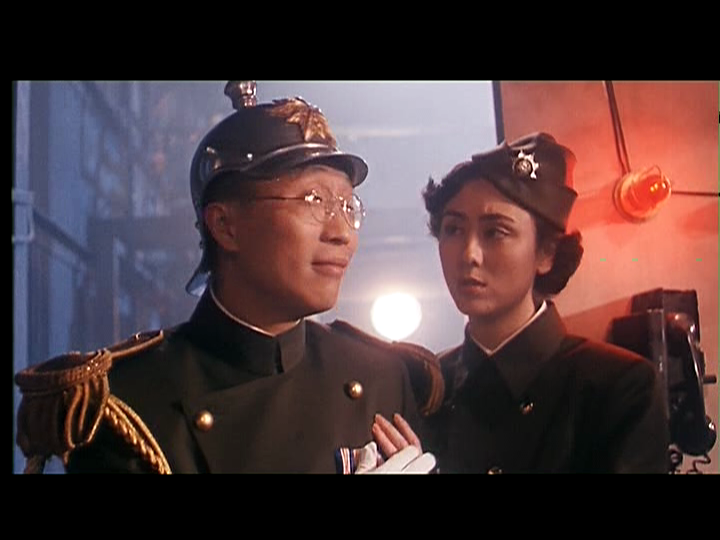 Also, the man who is depicted as her first love in the film and whose path frequently crosses with hers is a Japanese military officer named Masahiko Amakasu (Derek Yee). 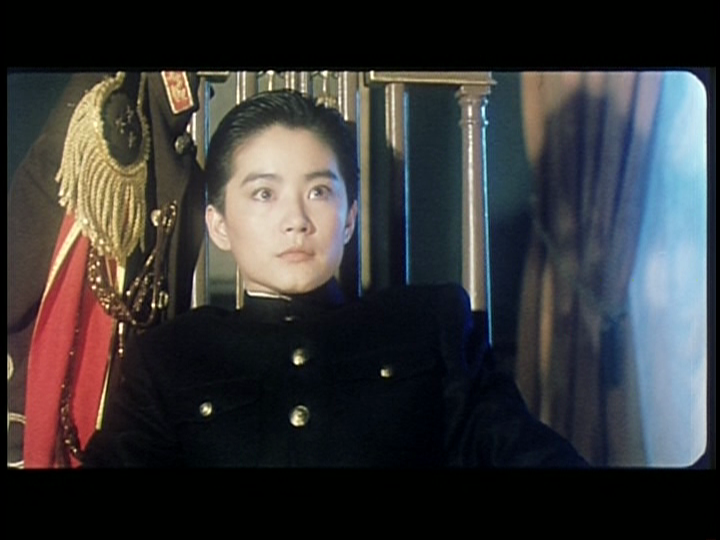 In real life, Amakasu, as mentioned above in the discussion of THE LAST EMPEROR, was a powerful presence in Manchuria and may never even have met Kawashima. 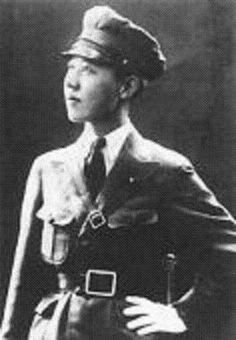 The man who was her first love in real life was a young officer named Toru Yamaga, as identified in Birnbaum’s book. 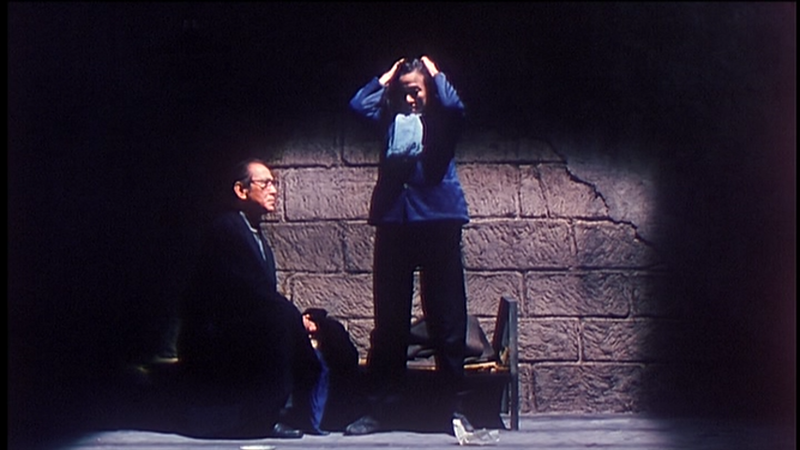 Kawashima’s behavior toward Amakasu in the film matches her behavior toward Yamaga, as recounted by Birnbaum. 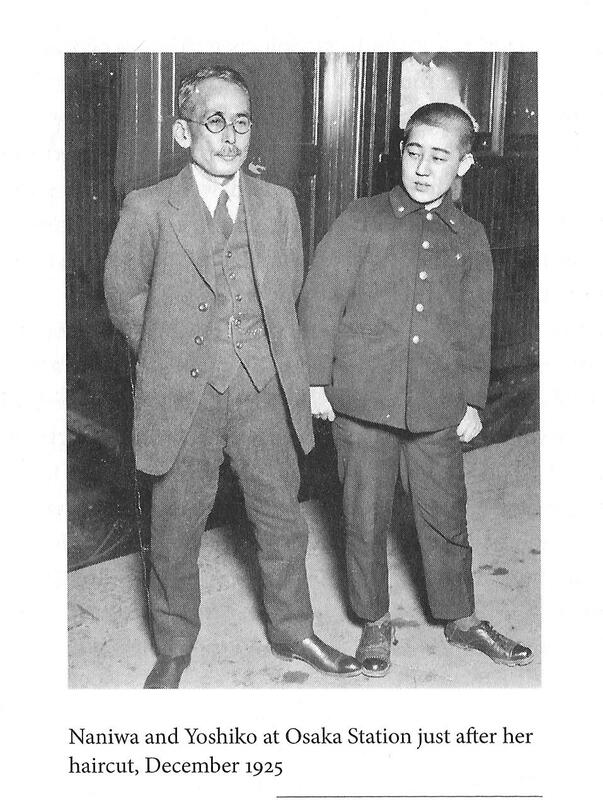 Yamaga was one of the men assigned to kill Kawashima, but he couldn’t bring himself to do it. 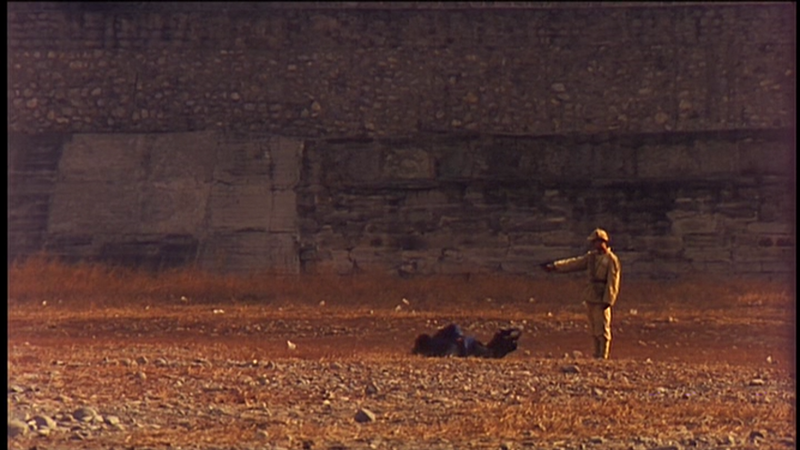 In the film, Amakasu takes her to a temple in Japan and even pulls out a gun behind her, but ultimately sets her off in a boat somewhere. The narrator of the first section of Buruma’s book, an assistant to Amakasu named Sato, appears to have been based on Yamaga as well. 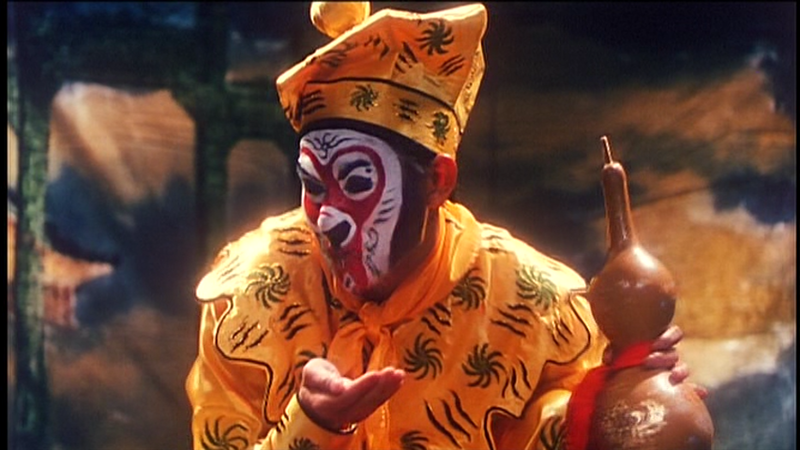 In the film, Kawashima also finds a lover in a young man who performs as the Monkey King in a Chinese Opera theater in Shanghai. 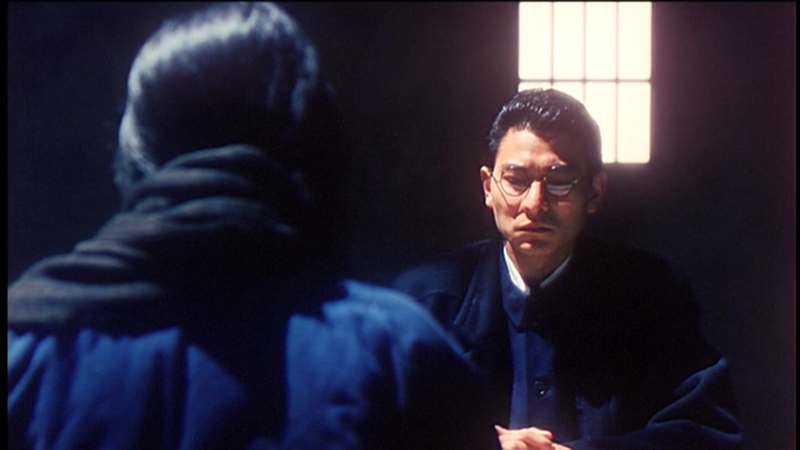 His name is Ah Fook (Andy Lau) and he is adamantly anti-Japanese and appalled when Kawashima reveals who she is. 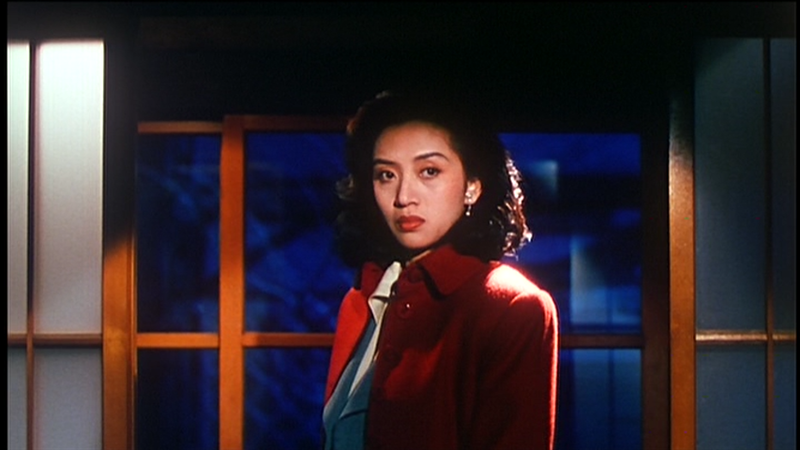 He had, up to that point, identified her, in the subtitles at least, simply as a “Japanese broad.” But their paths cross frequently in the film and he even shoots up her restaurant at one point and kills a Japanese official, yet she manages to get him remanded to her custody and they even debate her positions in one very good scene where she makes a case for using the Japanese to achieve the end of creating a stronger, unified China. As far as I can tell, the real Kawashima would never have taken such a lover although Buruma’s novel makes a reference to the way she befriended her favorite Chinese Opera performers in Shanghai and Birnbaum’s book recounts an incident in which she supposedly swindled money out of a Chinese opera performer. 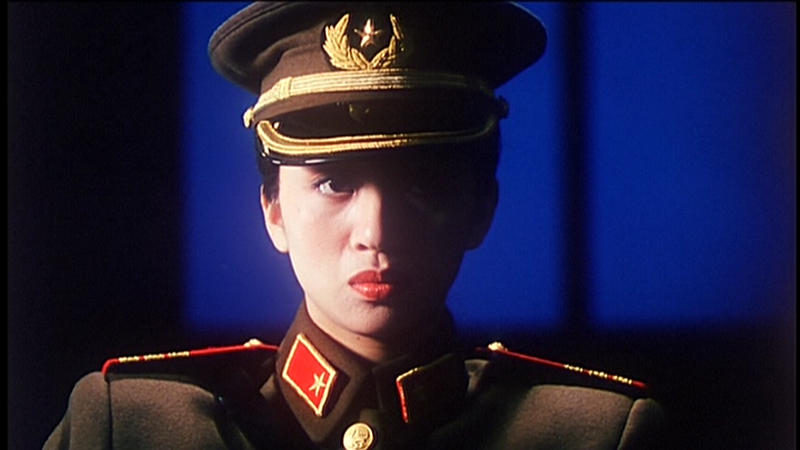 Mui is quite the cool customer for most of the film and looks great in the various costumes she wears in the course of it. 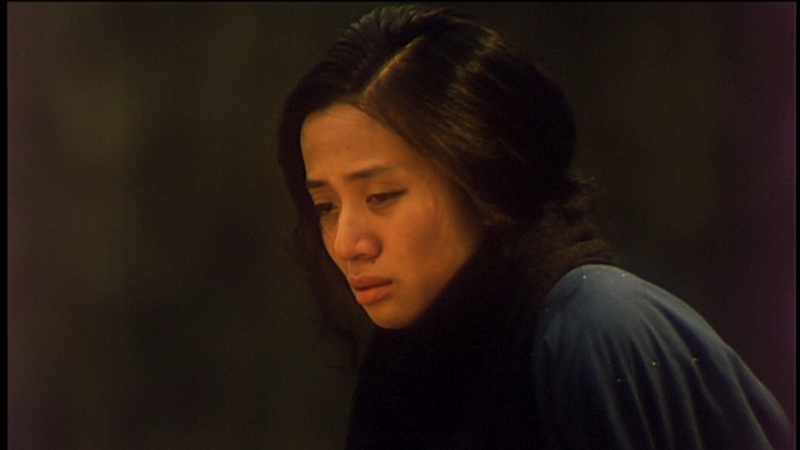 In any event, I think Mui succeeded at capturing Kawashima’s vulnerability and I only wish the film had shown more of that aspect of her personality. 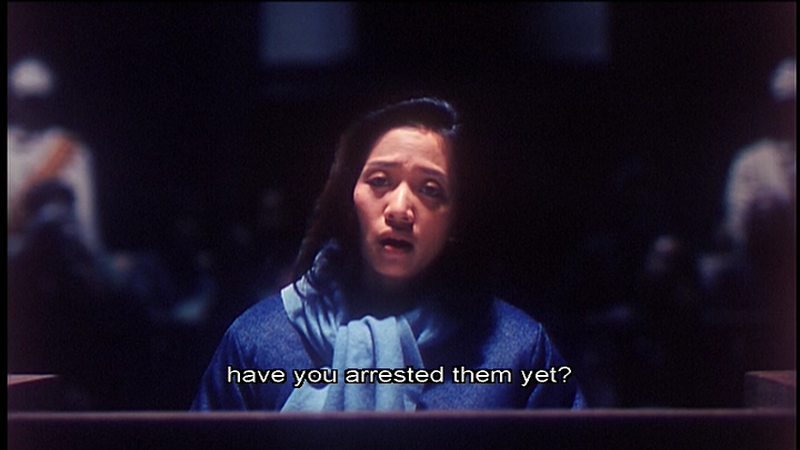 Mui is best when she’s allowed to be dramatic, as in her debate scene with Lau and in her breakdown in her cell when she learns that her adoptive father’s letter to the investigators will not back up her assertion that she’s a Japanese citizen and therefore out of the court’s jurisdiction. 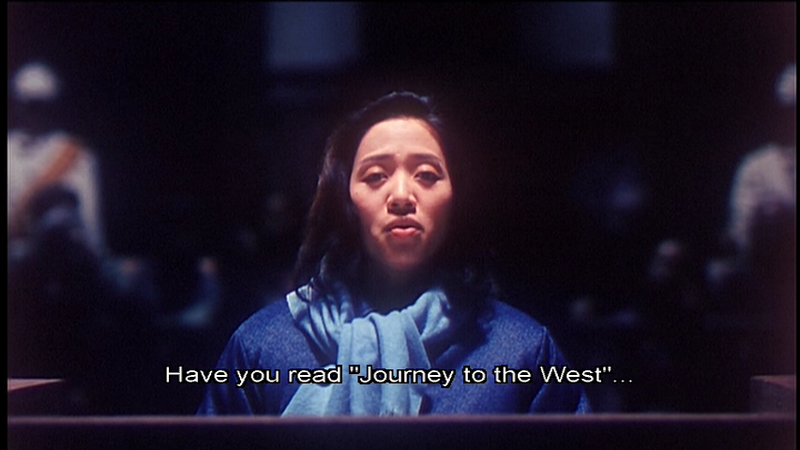 She’s also quite compelling in her defiant testimony at the trial where she ridicules the court’s use of evidence from the novel about her by asking if they’re going to arrest the demons in Journey to the West or the prostitutes in Golden Lotus. 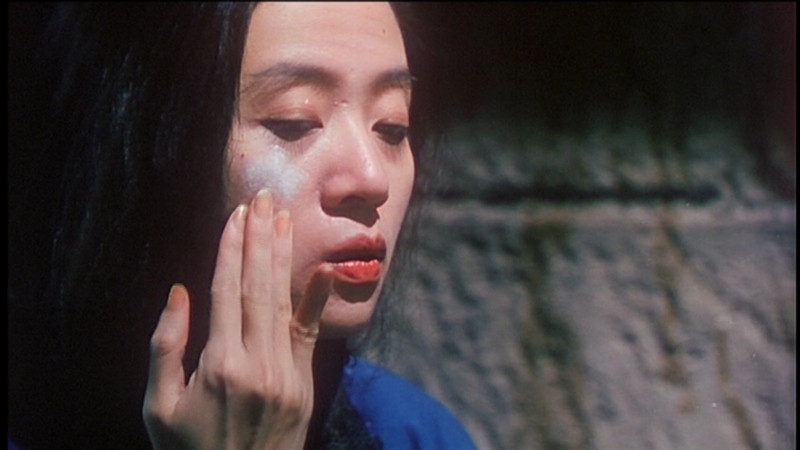 Mui does the entire trial and prison sequence without makeup and the song heard over the final minutes is sung by her. 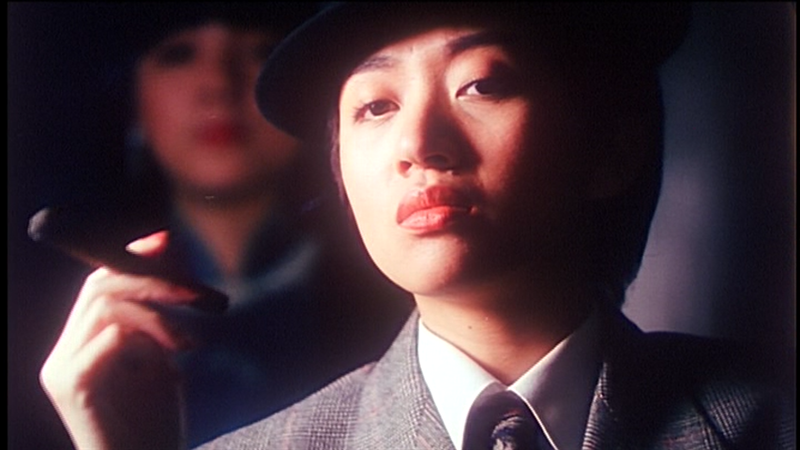 (Mui, known to Hong Kong buffs in the U.S. for such films as ROUGE, THE HEROIC TRIO, DRUNKEN MASTER II, and RUMBLE IN THE BRONX, among others, was also a Cantopop singing star known as “Madonna of the East.”) Mui herself died of cervical cancer in 2003 at the age of 40, the same age Kawashima was at her death. 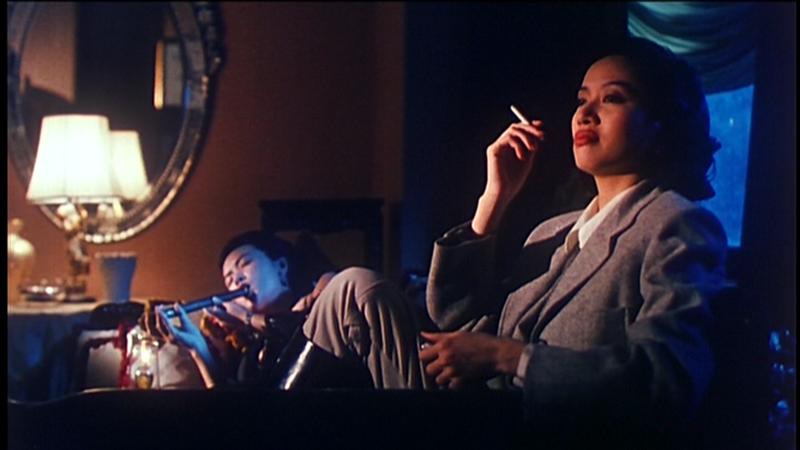 The film was shot entirely in Cantonese, although all post-dubbed, and the DVD includes a post-dubbed Mandarin-language track as well. 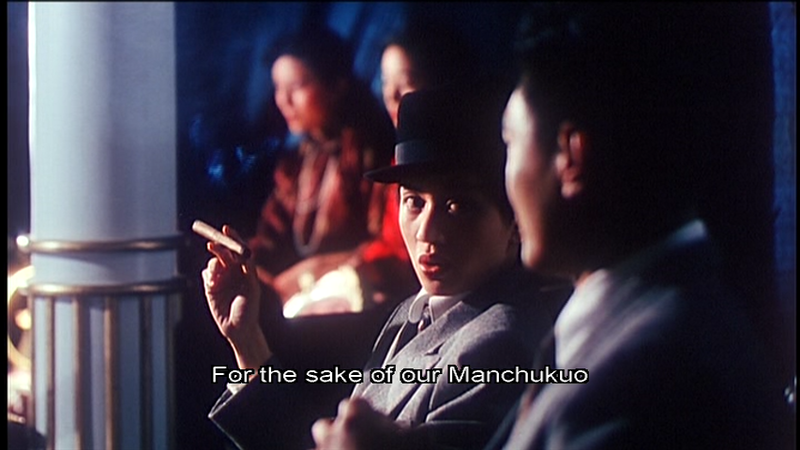 (I believe it’s Mui’s voice we hear on the Cantonese track.) 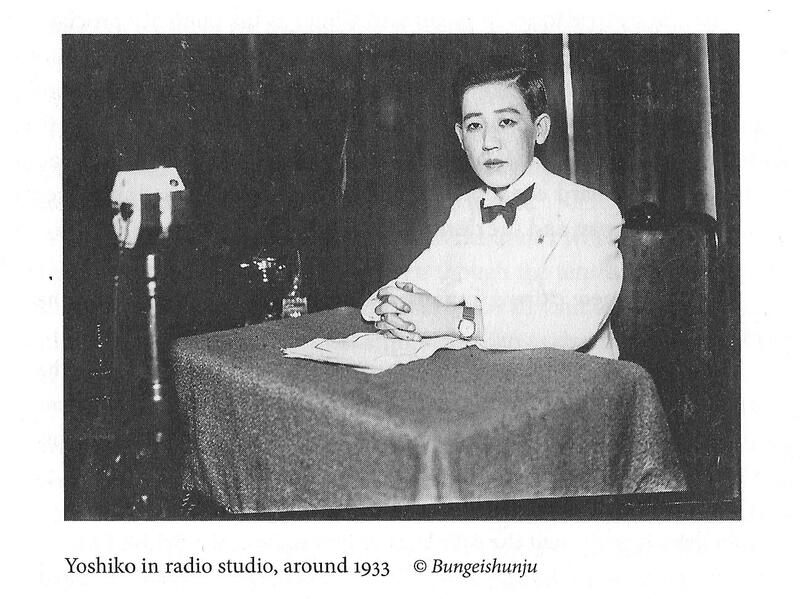 No Japanese is spoken, even among the Japanese characters, although Japanese-language songs are heard on the radio. All the Japanese characters are played by Chinese actors. This goes against the painstaking efforts to achieve authenticity in so many other areas of the production: locations, sets, costumes, props, dress extras, period songs, archival footage, etc. I have no idea what the Japanese think of this film or if it ever even played there. 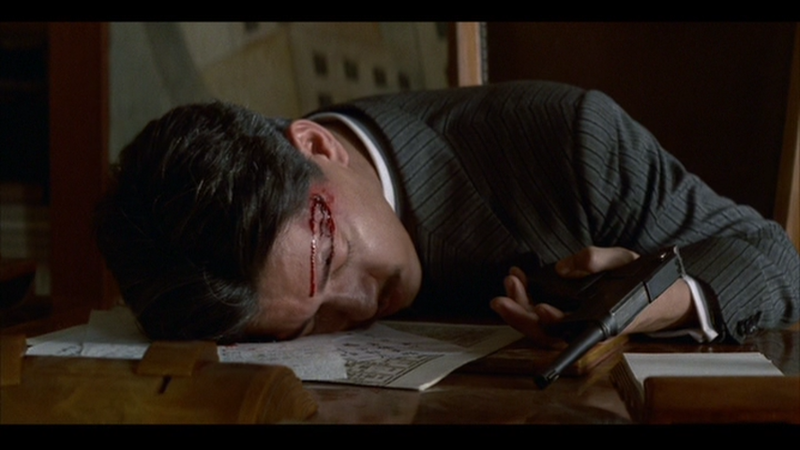 I wonder if this film had any influence on the makers of THE RAID and their decision to leave the Japanese out of it. KAWASHIMA YOSHIKO is a Golden Harvest Production and I purchased Fortune Star’s DVD edition. 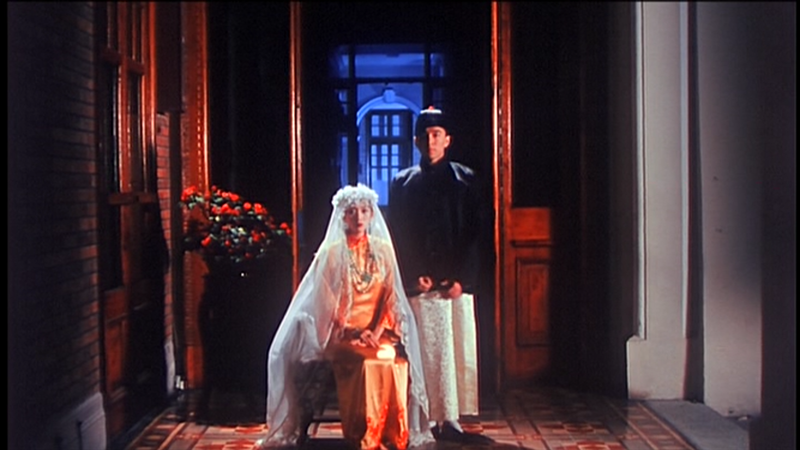 It was directed by Ling Ching Fong, who directed only three other films, only one of which, AN AMOROUS WOMAN OF TANG DYNASTY (1984, Shaw Bros.), is in my collection. 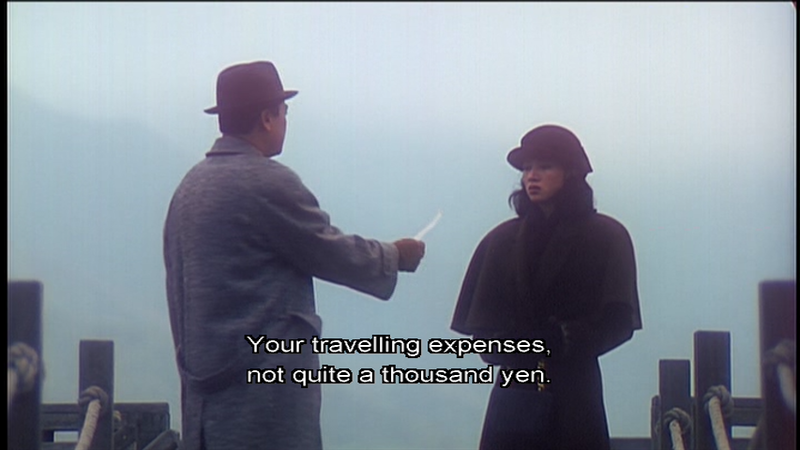 Here is my IMDB review of KAWASHIMA YOSHIKO. There’s a lot to process here and I’m guessing that the more I read the more difficult it will be to figure out who and what Kawashima really was. Right now, I find the Birnbaum book to be the best source of information about her that I’ve come across. But even her book can’t overcome the lack of direct evidence implicating Kawashima in the treasonous acts she’s supposed to have committed. Ultimately, she may have been just a willful, impulsive girl who was very confused about who she was and where she belonged and sought to assert herself wherever she wound up. She was vulnerable but not easily controlled or manipulated. For better or worse, she did what she wanted to do and learned early on not to trust those who were closest to her. I’m not sure we can ever know what she was really like. But that doesn’t mean we should stop trying. I wish I knew a scholar of this period whom I could discuss all this with, someone without an agenda, who doesn’t apply unhelpful labels (such as “Japan-basher”) to anyone trying to know and understand people’s behavior during this period. There was a lecturer on Shirley Yamaguchi at Japan Society’s series who got very upset when I asked him about Buruma’s book and said he’d refused to help Buruma and had never read the book. Such squabbles don’t expand our knowledge, yet they seem to be quite common in academia. ADDENDUM (August 4, 2016): I notice that this entry has been getting a lot of views recently and I wonder if there’s a wave of interest in Kawashima or some new spurt of research about her. Are the people who are finding this piece also reading Phyllis Birnbaum’s book? If not, has it spurred you to seek out her book? How did you discover this piece? What drew you to it? Was it helpful to you? Are you doing research on Kawashima for some project? If you read this and can answer any of these questions, please leave a comment here. Or use the form provided below to send me a personal e-mail. Thank you.